The Loudest Sound In Recorded History Was The Result Of A? The U.S. Military Will Maintain A Giant Telescope In Australia To Keep An Eye On? When it comes to matters of loudness, there is incredibly loud but local (like a firearm discharged in close quarters that permanently damages the hearing of those immediately nearby) and then there is incomprehensibly loud and far reaching (like an explosion so forceful that it ruptures the eardrums of people 40 miles away). 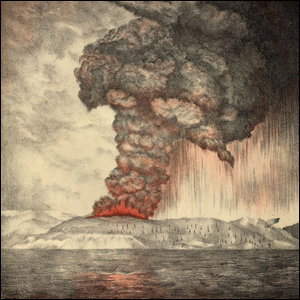 The latter is the kind of explosion we’re talking about when we talk about the loudest sound heard in recorded history: the 1883 explosion of the Krakatoa volcano in Indonesia. The volcano began rumbling and venting in late May of 1883, sending columns of steam and ash 20,000 feet into the air. Eruptions began shortly thereafter and continued off and on for the next two months until August 25 when they suddenly intensified. On August 27, four huge explosions occurred over the course of the morning, all of them violent, loud, and triggering tsunamis. The final eruption was so violent that it generated a pressure wave radiating out from the island moving at 675 miles per hour with a peak loudness of 310 dB. To give a sense of scale to exactly how loud and powerful that was: it ruptured the eardrums of sailors, as we noted above, 40 miles away in the Sunda Straight, it spiked pressure gauges at a gasworks company 100 miles away off the scale, and the sound of the explosion was heard perfectly clearly up to 3,100 miles away. The pressure wave of the explosion was not only recorded on barographs around the entire world after the explosion, but the recordings continued for five days afterwards as the pressure wave circled the globe three and a half times. On top of the immediate effects of the explosion and the resulting tsunamis, the collective eruptions sent so much debris into the atmosphere that it changed global weather patterns. Average summer temperatures in the Northern Hemisphere dropped as much as 2.2 degrees Fahrenheit, and it took five years for global weather patterns to stabilize and return to pre-eruption temperatures and patterns. The only positive outcome of the explosion was that increased particulate in the upper atmosphere caused months of spectacular sunsets around the world—in fact, British artist William Ashcroft is best known for the thousands of color sketches he made of the post-Krakatoan sunsets and scientists have argued that the vivid blood-red sky in Edvard Munch’s famous 1893 painting The Scream depict how the Krakatoan-driven sunsets would have looked to Munch in Norway.